Just your basic, running-out-the-door-because-I'm-unbelievably-late kind of outfit. So, of course, I threw in an obnoxiously bright satchel to jazz it up a bit. What do you guys thrown on when you're running late in the morning? I need some new ideas to throw into the mix! When i'm in a rush I always add a hat. Hats make me feel more pulled together when they compliment an outfit. I also like to go for easy makeup. Foundation, mascara, filled in eyebrows, and a red or bright lip! ahh you still look so cute lady! love the pants with the denim! and the hair looks great! Your outfit is simply fabulous! If I"m in a major rush, I reach for a cute tank & a cardi, throw on slacks or a skirt. Usually my best outfits are the last minute ones. Maybe I should sleep in more often?! Love the neon!! i find the best thing to put on when i'm rushing in the morning is either a great dress (like the H&M one your boy picked out!) or my favorite jeans/t-shirt and a blazer. i love the distressed jacket with those cool plaid pants! I don't think anyone would ever know you just threw this together...looks great as always! I rely on my leopard shoes a lot because they really do go with almost everything I own and somehow look like I made more effort to make a statement than just throwing on my black shoes. I'm loving your hair too! You're the queen of neon! Also, it definitely doesn't look like you just "threw this on" - you look just as chic as you normally do! My last minute outfit usually consists of a variation of a blouse, a cropped jacket and a high waisted A-line miniskirt. I have so many of each in my closet that I just mix and match when I don't have the time to intentionally plan out my look! LOVE love love the haircut!!! No one would ever know you just threw that on, it looks so put together!! Ten times better than my "running-out-the-door-because-I-am-incredibly-late" outfit! Those pants are pretty jazzy, too! Love the bag. the new hair is magic my dear! I wish I looked that good running out the door because I was late for work! How do you get those curls in your hair? Are they natural? I wish I looked that good when I was running late. I usually throw my hair into a pony and hit the road. I also love a cute jean jacket! You wouldn't think the neon would match that outfit so well to look at first glance but on your it works amazingly well! I never look so well put together when I'm late! Something furry... a jacket, a vest... instantly comfortable & adds some instant chicness to a black ensemble! Love the Pop Of Colour!! Absolutely loving the new cut... you have so much edge now!! new look def agrees with you! and of course the awesome outfit only adds to it! i throw on my sunnies because i don't have time for any make up :) looking great! You trow that when you're running late?You should see me all messed up! 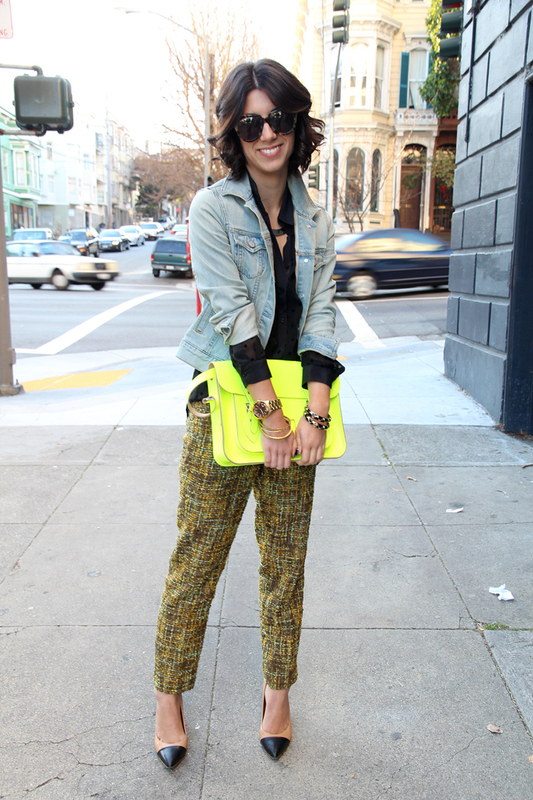 :-) Amazing pants,love how they look with neon bag! You look so stylish for someone who was running late! My running-late look always involves skinny jeans, riding boots, and giant sunglasses to hide my makeup-free face! I love this styling! It definitely doesn't look thrown together ha ha looks fab! I need to get on the Zara shoe bandwagon. Those heels are amazing! I mean, the whole look is great. The pop of technicolor works so well. For me it's either some gigantic earrings or a bright shade of lipstick. Specifically with the lipstick, I'm always surprised and impressed with how much of a difference it makes. oh how perfect! 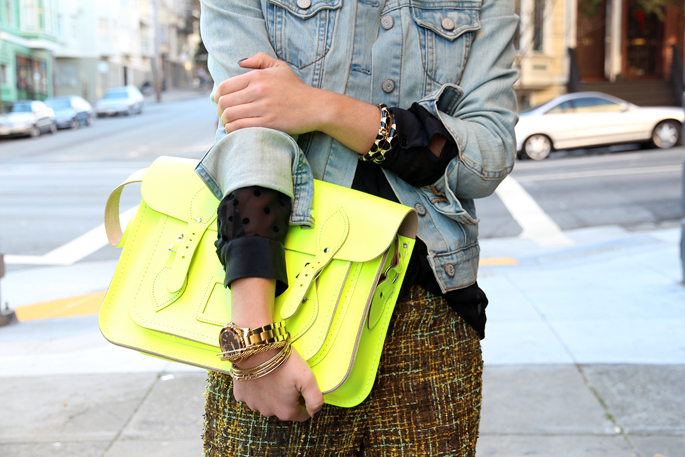 I just ordered myself the yellow cambridge satchel and CANT WAIT to get it :) love the neon with these J.Crew pants! I usually reach for a dress and cute flats or a tee and big statement necklace when I'm late - so easy to throw on but looks like you dressed up a little. I love your pants and bag together! Always skinny jeans, knee-high boots and a button-up blouse. Always. I wish I looked this chic running out the door! I've been away from checking my favourite blogs for a few days. So I'm just seeing your lovely new haircut now! You look great! Unfortunately I know those kind of days all too well! You look fab though! My "I'm too tired/late/lazy to try" uniform consists of a long, loose tunic, black skinnies, a black cardi for warmth if needed, and either flats or wedges, depending on whatever's closer to the door. I always throw on crazy earrings with it to add some pizazz to the ensemble though. I usually have a pair in my purse, so they go on in the car on the way to work! Cute outfit. San Fran looks so pretty. love that skirt! The bag really brings out the subtle neons! Fantastic pairing with the neon bag. When I'm running late (or just being lazy) I stick with basics and make sure I throw on one statement piece of jewelry or a great scarf. Does the trick everytime.